2015 Q2 Quarterly Commentary: Slowly Simmering – Barely Cooking! During the summer months some of us like to cook outside – and slow cookers seem to be all the rage this year! The food may seem to take forever to cook, and we often can become impatient waiting for signs of progress. We may have the same feeling when contemplating most of the world investment markets. Investors have finally decided that a diet of foreign bonds paying negative interest is unhealthy. While in the U.S. we are still w-a-i-t-i-n-g for the Federal Reserve to raise interest rates. The latest forecast is for a September rate increase. We can only hope! In the meantime the bond markets are suffering and definitely cooling. We saw big declines in bond values and returns for the second quarter, as hope for an interest rate increase in June evaporated. Consumers in the U.S. enjoyed a little relief as energy costs declined – a useful prelude to the summer driving season instead of the usual increases in gas prices. Housing is recovering, employment is stabilizing and, although excruciatingly slow – we are indeed cooking here! We experienced lots of thrilling and unnerving action both up and down the court in the markets. At year-end 2014, the S&P 500 was the All-star and International positions were the under achievers. The opposite proved true in the first quarter of 2015. 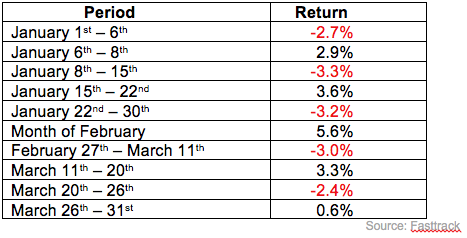 The chart below captures the S&P 500’s volatility during various periods as it rotated between winning and losing for an overall quarterly return that was just under 1%. Lots of action – not much traction! Uncertainty around the interest rate policy of the Federal Reserve has contributed much to the volatility. Fed Chair Janet Yellen’s last statement announced, unhelpfully, that the Fed is “data dependent” and the pace of interest rate increases could “speed up, slow down, pause, or reverse.” The main driver of the stock market is always corporate earnings, rather than political or media pronouncements. The strengthening U.S. dollar hurt U.S. companies’ foreign earnings, which were down 5.3% in the 4th quarter 2014. A strong dollar makes U.S. purchases abroad cheaper and foreign purchases of U.S. products more expensive. Most of the companies in the S&P 500 receive at least 50% of their earnings from abroad. The current volatility brings back memories of how terrified Americans were in 2008 when the S&P dropped 37%. It is a test of resolve to follow Warren Buffet’s advice to “buy when others are fearful” – a methodology that works! Yes, such opportunities are fearfully predicted and always unpleasant, but in retrospect every market correction stabilizes over time. It begs the question: if downturns produce great buying opportunities, why are we afraid of the next one? Having well balanced portfolios and enough cash for current needs, allows us to stay the course during market corrections knowing that the investments will support your spending needs for many years beyond today’s headlines. Our technical indicators are showing weakness in the emerging markets asset class, so we will immediately reduce those respective allocations by up to 25%. 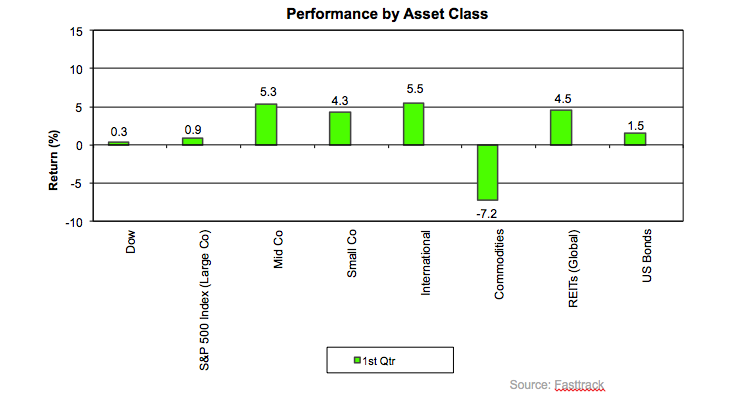 The chart below reflects the performance of various indices over the past quarter. The chart shows that even in a poor quarter for the S&P 500 other categories mostly did well – a March “win” for asset allocation and proper diversification. On our website (shwj.com) every other Thursday we post our most recent economic discussion from our Investment Committee meeting. Just click on “Blog” in the upper right hand corner to listen in. Our offices will be CLOSED Monday, May 25th for Memorial Day and Friday, July 3rd for the July 4th holiday. We will continue our tradition of closing our office at 1pm each Friday from Memorial Day to Labor Day so our hardworking staff can take advantage of the lovely Colorado summer! Of course we will be available if you need us, yet we would appreciate your calls on Friday mornings if possible. In our quarterly reports to clients, we always include commentary on the markets, economy and other financially relevant information. Our 2014 Q4 reports recently went out, and we wanted to share our commentary with you as well. We would also love to hear your questions and comments in the comments section below. We think that would be a good resolution. However, focusing on the financial markets around the world will rarely help! The Media elicits emotions that cause lots of dissatisfaction and fear. If you had thought that the S&P 500 was the best place to be in 2014, think again. The top performing market of 2014 was China (up 44%)! Who would have guessed?! 2015 will probably be the year the Federal Reserve raises interest rates – very carefully (Source). We expect that our US bonds and stocks will weather the change well, despite turbulence and dire headlines.